There are several reasons why you may want to hard reset your iPhone 6, 6s, 6 Plus, or 6s Plus. You simply feel it’s to much bloat on in and it is not moving as smoothly as you’d like, something isn’t working as it should or whatever other reasons you might have, a once in a while reset is more than recommended to do. Especially if you made several iOS updates without resetting your iPhone in between. Let’s see how to reset your iPhone 6 and make it like brand new! Resetting Safely – Backup first! This step is a must! You might loose precious data if you think about resetting your phone without a proper backup. If you prefer to do it on iCloud it’s OK, but the recommended way is trough iTunes on your Mac or PC. You can reset your iPhone 6 in two ways. Perform a soft reset directly from your phone. This will keep your firmware intact and only delete some specific elements from the system and / or the content (Apps, Photos and Videos) if you choose to. This method is recommended only if you want to clean your phone quickly. Perform a hard reset (firmware restore) from your computer using iTunes. 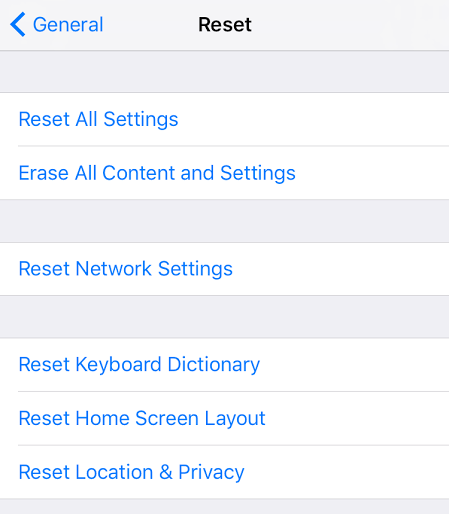 This reset type is recommended if you feel that there are some glitches with your Operating System (iOS). The firmware will be deleted and replaced so any firmware related malfunction should be fixed be resting your iPhone this way. Basically, it’s like having a factory new iPhone in your pocket after performing this reset. When I do this, I usually carefully clean my iPhone so I really do feel like I’m having a new one. Reset All Settings – will reset all iOS settings to their default values but it will keep the pictures, videos and Apps intact. Erase All Content and Settings – will reset all iOS settings to their default values AND will delete any content from your iPhone. Now having a backup of your cool selfies definitely comes in handy. Reset Network Settings – Say you played around with some proxies and you want to get rid of them, or you found out that it’s not the safest thing in the world to connect to any free Wi-Fi networks but you’ve already saved a bunch of them, from here you can simply reset only the setting related to your network connections. Reset Keyboard Settings – All those strange tests you did with your keyboard can be reset from here. Be warned that Auto-correct will be on now and some funny messages might go out. Reset Home Screen Layout – Simple reset Home Screen Layout settings from here. Reset Location & Privacy – Location services and privacy settings can be reset from here. This comes handy when you are not sure what permissions you gave to each App. You will be prompted for Privacy and Location access by each App is using them once you’ll open the Apps after the reset. Instead of “Erase All Content and Settings” I always prefer to do a “hard reset” called also a DFU restore. I really need to put emphasis again on the backup and be warned this will really erase everything on your iPhone 6! To do a DFU restore you need to connect your iPhone to your Mac or PC. Put your phone in DFU mode and perform a restore from iTunes (simply click the Restore button and iTunes will do the rest). This action will replace your firmware, reset all settings to their default values and erase any content you have on your iPhone. After a reset you can recover your backup files from iTunes and you are good to go, or simply setup your phone as a new iPhone.